Have you heard of popin’ cookin’? This candy craze has been sweeping the internet (well the tumblr-y, youtube-y parts anyway) where you use a kit to make your own sweets or savoury snacks. Most are gummy sweets in the shape of something different, like fruit gummy shaped like sushi! However some, like the curry kits, make real, tiny, portions of whichever food it’s meant to be! Whoa! Interested? Join us as we attempt (and fail miserably) to create our very own Popin’ Cookin’ masterpiece! The Popin’ Cookin’ bento set offers a good mix of sweet types with gummy veg, soda flavoured onigiri and orange flavoured kara age chicken (with a texture between gummy and chewy cotton candy), and grape flavoured soft spaghetti. Despite our incompetence this kit is actually very straight forward, but we’d definitely recommend helping out any younger kids making this to avoid tears. 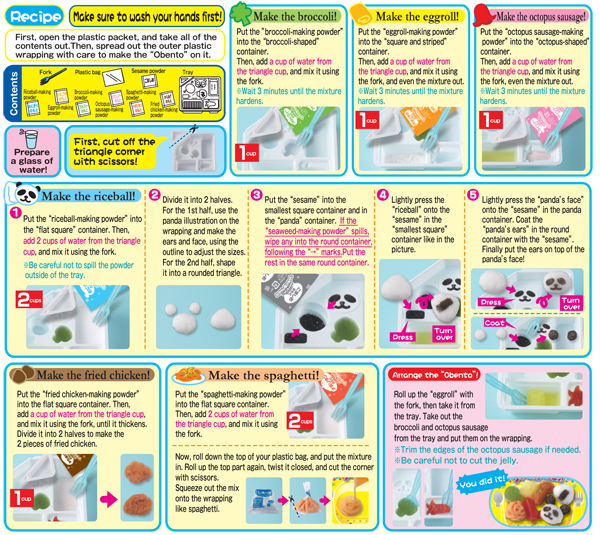 When we first started this blog post, we wanted to create a useful guide to making Popin’ Cookin’ items (also we LOVE gifs), but unfortunately our results were less than appetizing or instructional. So rather than telling you how to make this, let our disaster serve as some tips on what NOT to do. Make sure you double check how much water you add to each section, it’s easy to mis-read and end up gummy soup! *cries* If you added the right amount of water but your gummy is looking a bit wibbly wobbly still, leave it a bit longer. Worst comes to the worst and it gets too gummy you can just pry it out and straight into your mouth! On the other hand, be careful with your mixing. Get too enthusiastic and you’ll have candy overboard, and end up with tama-broc-onigiri. The onigiri sweets are slightly different to the gummy hotdogs and tamagoyaki and you will need to roll it for a little longer than expected to shape it as it’s super springy! So don’t be afraid of pressing down quite hard to get a nice outline for the panda face and nori pattern for the onigiri. On the other hand, don’t mash too hard with the fork when you’re rolling the ears in the sesame. Our panda ended up a little… flat. How to Actually Make Your Gummy Bento Look Amazing! Here are the proper instructions by Kracie! Pretty much puts our efforts to shame, we strongly recommend you print out a copy and have it with you while you’re popin’ cookin’. You can also check out the expert video below for more guidance. Think you could do better than us? Know you could do better!? Check out the range of DIY candy kits available at Japan Centre. Our fave is the sushi candy set, but they’re all pretty great. Posted in Food and tagged diy candy. Bookmark the permalink.